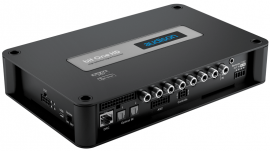 After revolutionizing the car audio world with the bit One digital processor, thanks to continuous research in the digital domain, Audison now introduces the bit One HD, capable of processing hi-res audio signals. In the world’s most important recording and mastering studios, audio signal is digitally processed at a standard 24-bit/96 kHz resolution, to preserve every single nuance even after multiple processing (dynamic range compression, equalization, ambient sound effects etc.). 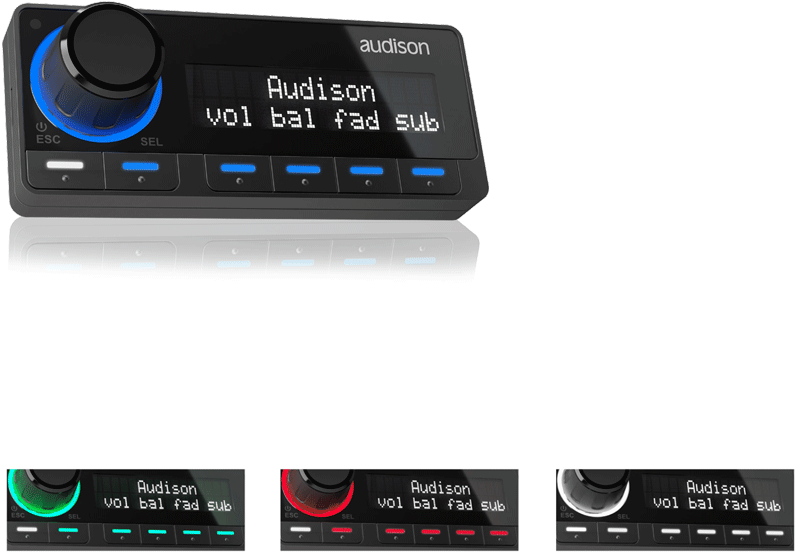 Thanks to its “Istinto Innovativo”, Audison achieved the same audio quality as professional digital workstations for the car compartment. The bit One HD makes the most of Hi-Res files reproduced by an Audison bit Play HD, giving providing the ability to develop a Full DA HD chain. The audio signal is not subject to any down-sampling and is sent to Audison amplifiers equipped with AC/AD link in digital, preserving all the information of the Hi-Res digital file reproduced. Connecting the bit One HD to the Audison bit Tune through an automatic procedure, all the processor’s basic audio parameters can be optimized (time alignment, equalization and output levels) ensuring an excellent acoustic result. This phase also includes the diagnosis of common connection “errors” (phase/channel inversion no signal on one channel, low signal level etc) to set the specialist free from “routine” work and allow him to focus on the art of “fine-tuning”. The Audison R&D team developed the new management software user interface to make the system configuration and calibration processes as user-friendly as possible, according to specific criteria required by the car audio industry. The system setup is graphically managed and all the tuning features can be accessed intuitively. 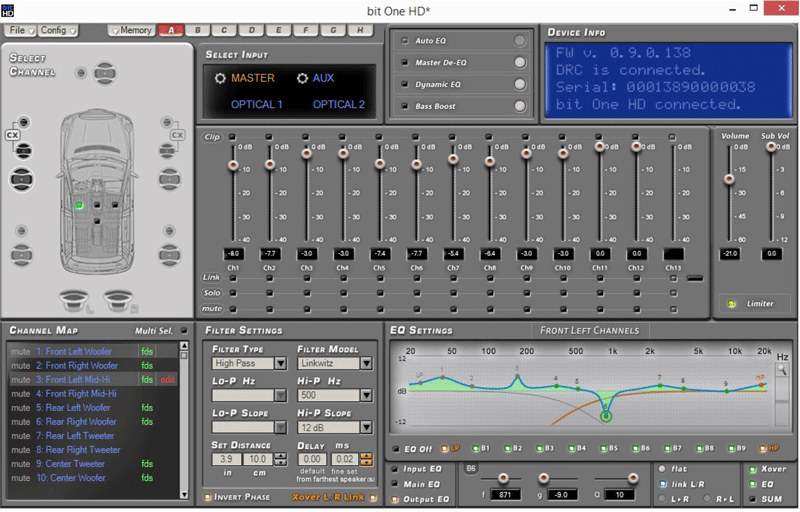 The bit One HD features 8 memories for the pre-sets for the Windows-based (Windows 7, Windows 8, Windows 10 ) PC software and can be used in two different “working” modes: the Standard mode, to achieve great results with a simplified system management and the Expert mode, to freely access all the parameters for an all-round tuning experience. The bit One HD is equipped with a guided configuration routine which automatically synchronizes the input audio channels, which are often time-delayed from the OEM source or amplifier, prior to the signals summing. A De-equalization of the OEM system frequency response is then performed, featuring linear-phase FIR filters, to obtain an unparalleled reconstruction of the original signal without altering the phase response. 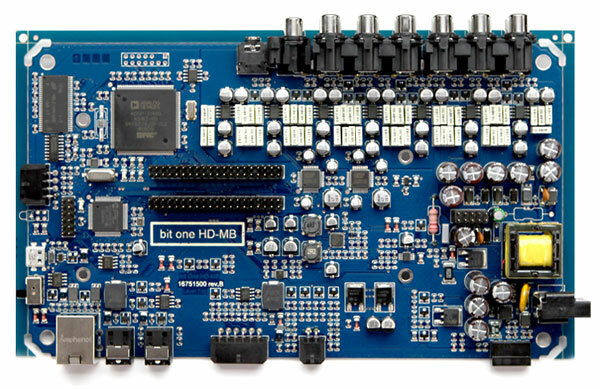 The bit One HD is equipped with two optical digital inputs (TOSLINK) to connect the bit DMI interface to the processor simultaneously, allowing the user to extract the digital audio signal from an OEM system equipped with factory MOST bus and from a bit Play HD to listen to Hi-Res files. The 12 analog along with 2 auxiliary inputs make it compatible with any OEM system and the 13 output channels, both analog (RCA) and digital provided with double AD LINK connector, provide the ability to create very complex full-active systems. For an absolute control of the car compartment acoustics, the R&D team has introduced three equalizers based on two different types of digital filters (FIR and IIR) to manage the frequency response: 5 parametric poles input equalization (MASTER and AUX), FIR type, to flatten the curve based on the input selected; IIR 11 poles output equalizer, to adapt the frequency response in the car compartment; 5 parametric poles main equalization, FIR type, to “shape” the sound of the entire system according to the user’s personal music preferences. The DRC MP supplied with the bit One HD features a reduced size and a total black look with possibility of customizing the RGB light of the volume control as well as the keys. A Joystick has been added to the volume knob, providing the ability to intuitively browse the menu, adjust the display colour and brightness and also control a bit Play HD that may be connected to the processor. The display features black ackground with white characters, for maximum readability also at daytime, and a brightness sensor, for the automatic setup of the Night&Day function. The bit One HD hardware employs very high performance Cirrus Logic converters to take full advantage of the dynamics of Hi-Res files played by the bit Play HD. The bit One HD further improves its integration level with OEM head units, offering full support to the management of the car priority signals such as gong signals, GPS messages and vocal commands whilst music is played through an auxiliary source such as the bit Play HD. The new functions listed below further enhance the processor’s control capabilities. 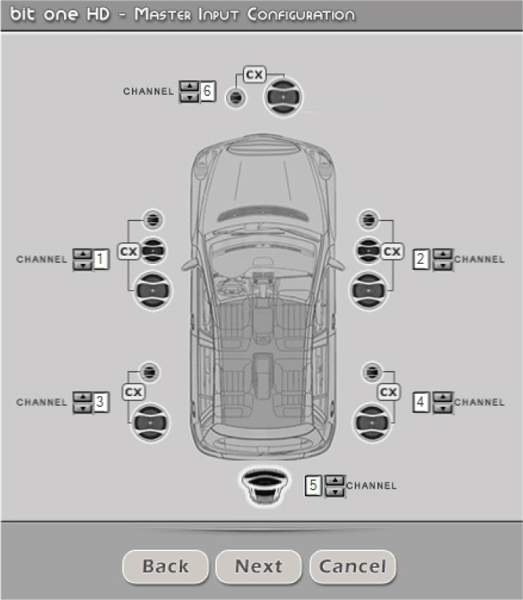 Function to select an auxiliary source (bit Play HD) and adjust its volume via the OEM Head Unit. 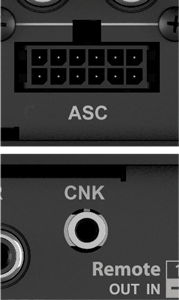 External service terminals to select the presets as well as the OPTICAL 1, OPTICAL 2 and AUX inputs. By registering the bit One HD to the bit Drive portal the processor will be always up-to-date: the PC software checks the availability of upgrades online and the user is constantly informed about the new functions available. In this way it will be a long-lasting investment. A dedicated software release will enable the user to process up to 6 + 1 digital channels with crossover FIR filters. 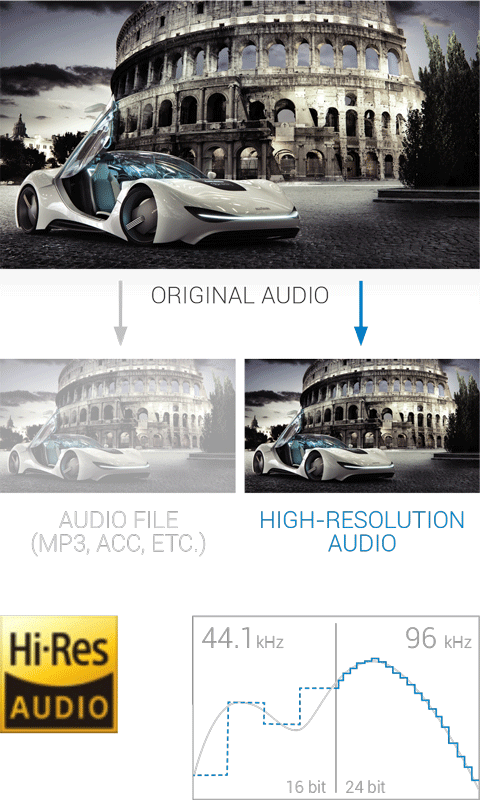 Through this type of sound processing, much more demanding in terms of calculation resources, a leading-edge in-car listening experience will be achieved. Adding the Wi-Fi optional module (under development), the user will control the DSP using a dedicated Audison APP available for Android and IOS tablets and smartphones. Hi-Res audio streaming up to 24 bit/96 kHz will be played by bit One HD using this Wi-Fi optional module. The bit One HD is suitable to be linked to a “twin” processor to obtain 26 output channels with IIR filters or 12+2 channels in FIR configuration. The kit will comprise a dedicated software as well as an external synch master clock. 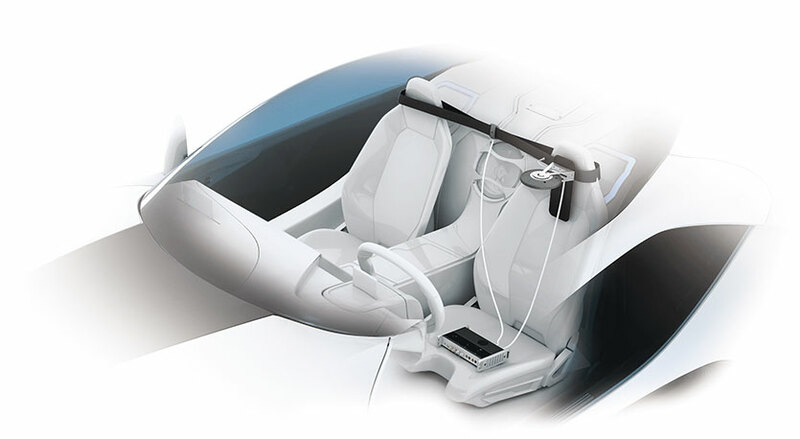 Communication port to be used in OEM integration with the future car industry protocols. Future applications will feature a microphone to nullify the noise.